If interested in tickets, please contact the church office at 281-363-9292 and ask to speak with the Family Life department. Bring your sweetheart to the Valentine Dinner Theatre and don’t get rushed in and out of your reservations! Join your friends and enjoy a delicious dinner catered by Bucca di Beppo. Once dinner’s done, get ready to laugh with the hilarious comedian Anthony Griffith. This is an evening you don’t want to miss. 6pm – Doors open to view Auction and Raffle items, and appetizers are served. 7pm – Dinner seating and service begins. 7:30pm – Dinner show with comedian Anthony Griffin begins. Intermission – last time to bid on Silent Auction and Raffle items, and dessert is served. 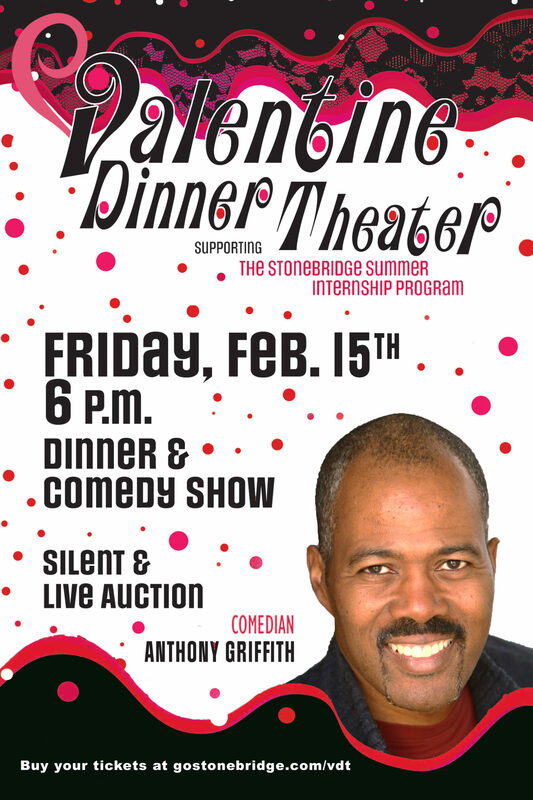 8:45pm – Enjoy the Live Auction followed by another comedic set by Anthony Griffith. 9:45pm – Auction and Raffle items will be available for immediate pick-up. Don’t forget to bring your checkbook and/or credit card! You’ll have the option to bid on some great merchandise for you and your sweetie during the Silent and Live Auctions. All proceeds go to support our Children’s, GAP, and Youth Summer Interns. KEEP CHECKING BACK! LIVE AUCTION ITEMS WILL BE POSTED SOON! Nursery – 3 year old at the Main Campus from 6:00pm to 10:00pm. Children will enjoy a light snack and fun play time. Childcare is provided by our dedicated childcare staff . Make sure to feed all younger children dinner before arriving. Price is $10 per child. 4 years – 6th grade Valentine Bash at the student building from 6:00pm to 10:00pm. Children will enjoy lots of games, pizza and a short movie at the end of the evening. Our Bash is hosted by our Children’s Director, Middle School Director and our Middle School Interns. Price is $10 per child. Our intern program consisting of College and High School students impacts the lives of our students from Preschool through 12th grade emotionally, mentally, but most importantly spiritually. Many of our interns find their calling in ministry through our internship program and continue on in ministry. If you are unable to attend the event but you would like to donate please click the button below. Any and all contributions help to grow this program. Thank You.